Change order is a part of the change management process. The implementation of changes in scope of work is agreed by the contractor, owner, architect or engineer. A certain change order is either a work that is added or deleted in the original work and hence to implement an alternation, a change order form is required. The completion of the work and amount are primary things that are signed up in a Construction Change Order Form There are many kinds of Construction Forms. 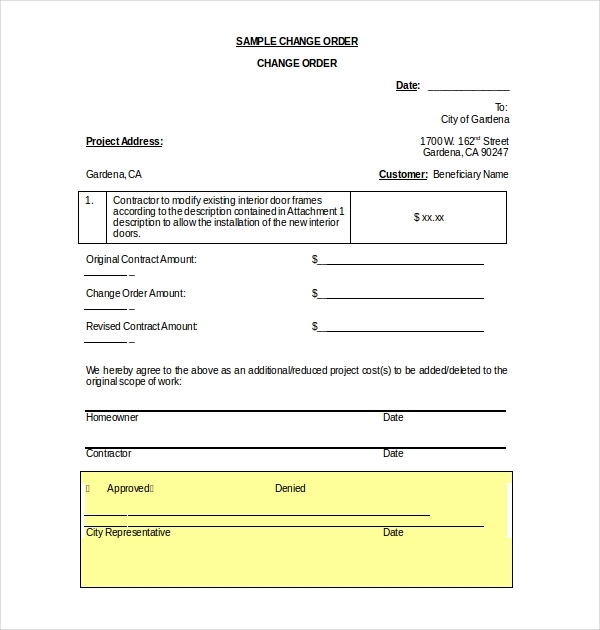 The projects that require changes in the construction need to have a construction change order request form. This form requires certain fields to be filled up, like description of changes needed to be done, amount negotiated, project name, original agreement, time of completion etc. The contractor, engineer/architect and owner sign the agreement. Contractors need to know about the changes that are required in certain construction projects. This form has the potential to know all the details about the project. All the specification and the fees amount are mentioned in the form with a compilation of the construction change chapter that explains everything regarding the change order. 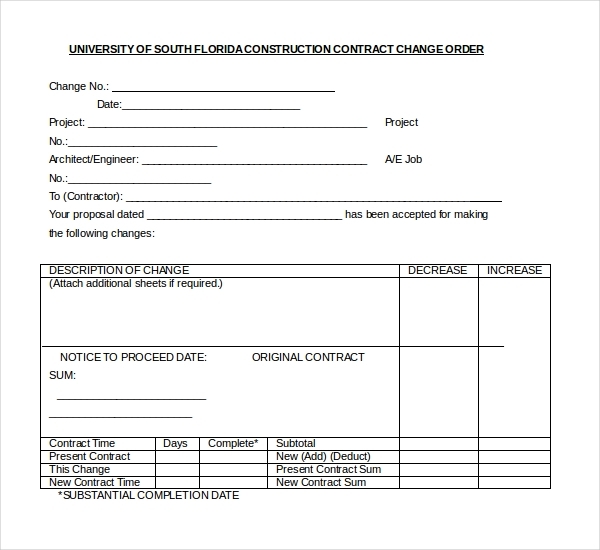 Change order forms of South Florida construction contract is used for changes regarding any design or structural issue for future. The changes must be completed in a specific allotted date. These changes are mandatory in a project with respect to any addition or subtraction in work. These forms are evidence of the changes made in a project. Many projects need changes in their design or architecture according to the orders given from above or because there may be a flaw in the construction. This is why construction change order form is required. You can download the sample forms and fill it up accordingly. 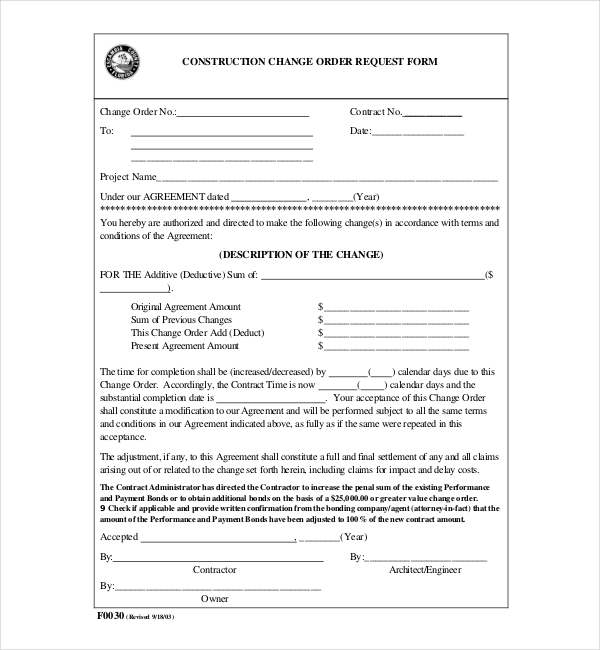 Construction companies hand out a change order form so that have a record for the changes required in a particular project. 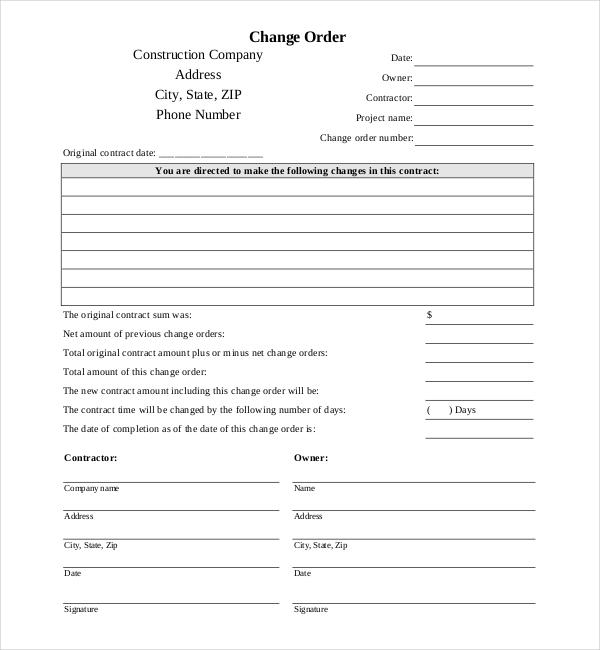 The change order forms are easily available online and you can download it for free. 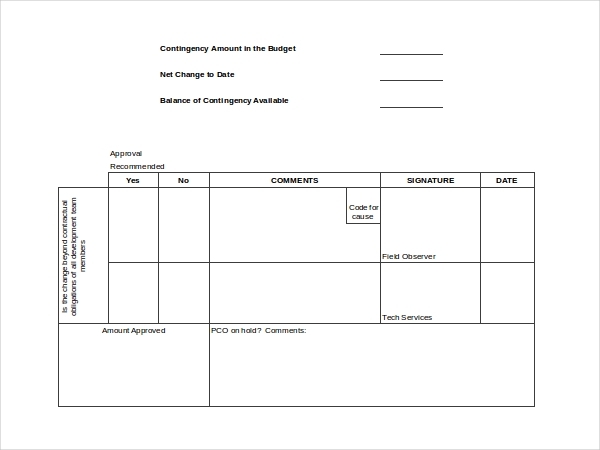 The changes order form needs the details about the change, amount specified, completion days and other details. The projects which are taking place through mortgage and need changes in it require filling up this form. The contractor and the mortgagor try to come to a mutual agreement and the HUD, that is, the Housing and Urban Development, approves this request in change after verifications. Only after their consent does the work begin. 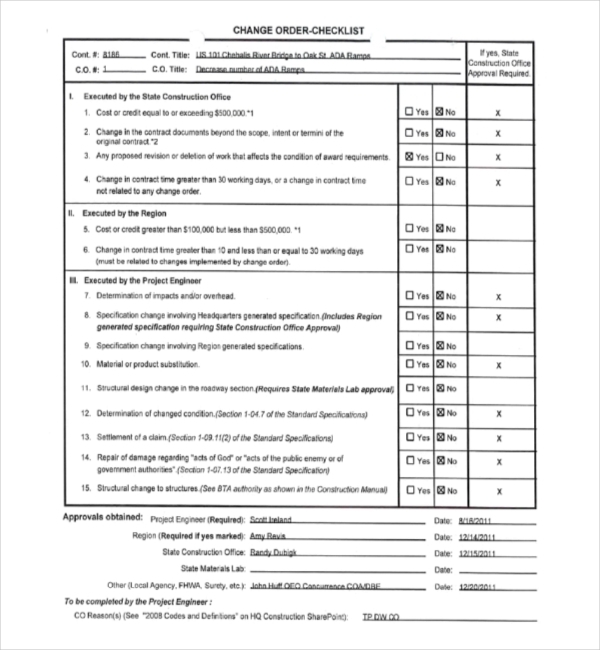 Construction change order request is a form for asking permission to have a procedure done for alteration in construction/design. This form is only a request to change the plan. The budget and other fields need to be filled up respectively. This later requires an approval by the HUD. 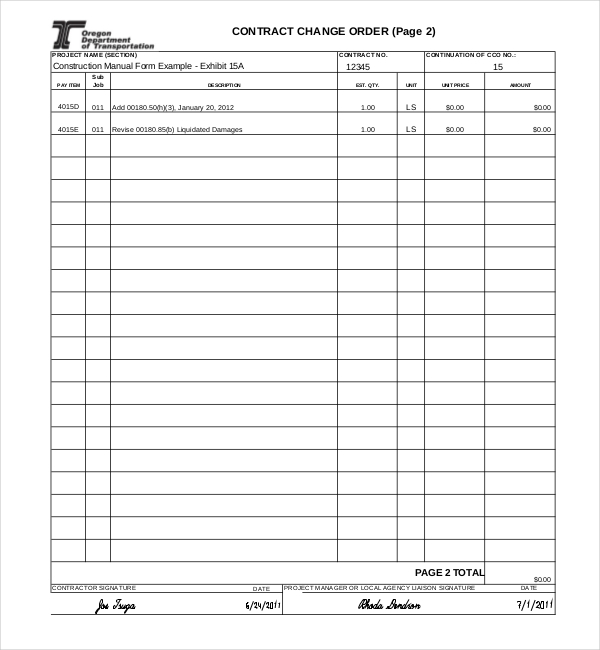 This construction change order guide is written by the State Division of Transportation, Washington that specifies the terms of change orders made. The manual is a guideline to what reasons you can state for changes, amount, what changes can be made, description, processing change order, negotiation etc. Willing to follow the changes will lead to further process. For people who would like to have some changes in their house need to sign up this form. Home remodeling is often required because of the interior design or any design flaw. Some complexes do not allow remodeling, due to which this form can be used as a way of asking permission for change. 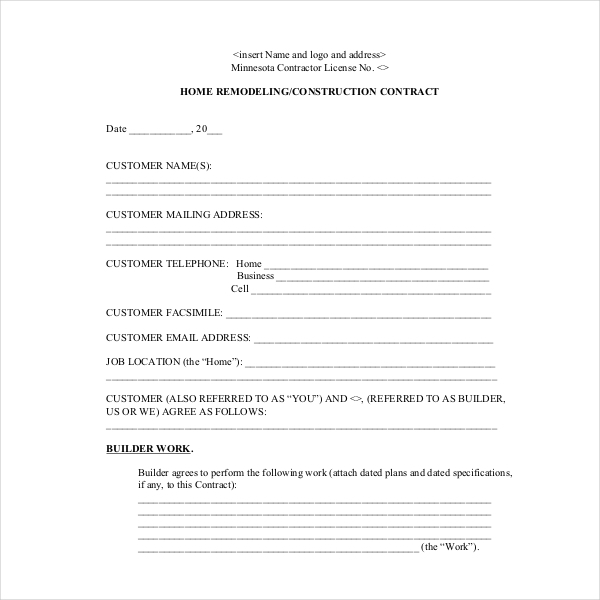 This form includes payment terms, customer cooperation, budget, time and change specifications in their home. The owner of the land needs to be present in some cases as well. This is a general form for the construction changes. The form has fields that need to be filled up as soon as possible like the reason for changes, amount estimated for changes, date of changes, project name etc. An authorized body must fill up the field and send it to the relevant company for modification work to begin. The estimation of the project was done incorrectly. The project head or customer discovers the inefficiency or possible efficiencies in the plan according to which the change order has to be issued. Additional time, money and resources required and because of this readjustment in the project need to be done. Extreme weather conditions leading to delay in the plan or leading to additional work in the original plan. By following this official procedure, you are in the advantage of getting a legal paper work. These forms are very useful for legal purposes. Many a times, certain problems come up like accidents due to natural calamities that lead to devastation of the construction. These forms will come in handy for change/reconstruction order. This can be evidence in court in case a misuse of the whole project takes place. The need to show this paper can help an individual or project to be safe. You are getting these templates online which will help reduce the time to go an extra mile for this form. These forms are widely used for alteration in residential areas, commercial set up, roads/flyovers, design alteration in gadgets etc. Change orders are a very common procedure in large projects. Often the time estimation goes wrong or an unpredictable situation takes place. While filling up the form, it has to be made sure that they are filled with valid reasons. Irrational reasons will be unacceptable as the budget and plan are important. Individuals dealing with modification in residents must take consent of the land owner if required. Without their permission, the changes cannot be performed. 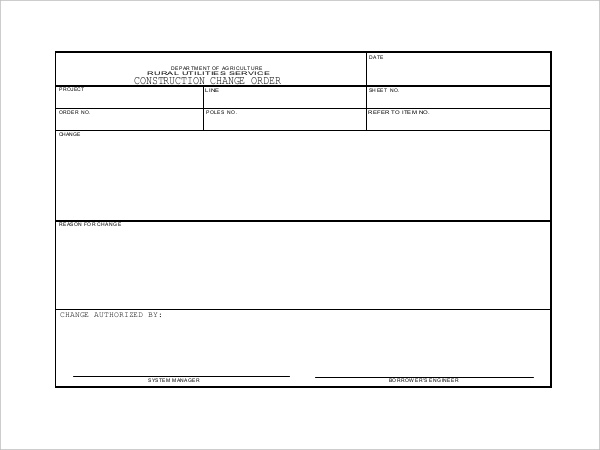 These forms are an evidence for delay or interruption that took place in the plan. This is also an agreement to make sure that the plan will be rescheduled as mentioned. Read the guidelines provided by Housing and Urban Development (HUD) department so that no errors occur. Original documents of the land/house must be present. If the land is on lease, then documents must be produced. If the construction changes are taking place by loan, then it is advisable to have the documents for that as well. A copy of this form should be kept. This will help all the parties to be in a safer side, in case one of them needs to show it for legal reasons. This form can be shown in the court of law as a proof that the changes were done legally and not otherwise. The new changes are thoroughly reviewed by the HUD so that no mistake in the new plan is found. It is also done for clarification about certain things if the approving officials find suspicious. Ever thought about getting such forms online? Know you can. These forms are readily available in our website. They are downloadable and can be customized by you. The printable forms have greater compatibility for higher and lower versions as well. Each form is carefully tailored so that you stay hassle-free while filling them. These forms have a success rate as high as 99%. They are available in both PDF and Word format so you can use it as per your convenience. In case you need further edits or customization in such forms, then we would be happy to help you. Stay tension-free as these forms are highly reliable. You are just a click away to download these forms extremely well-tailored forms which are quite important for all construction change purposes. 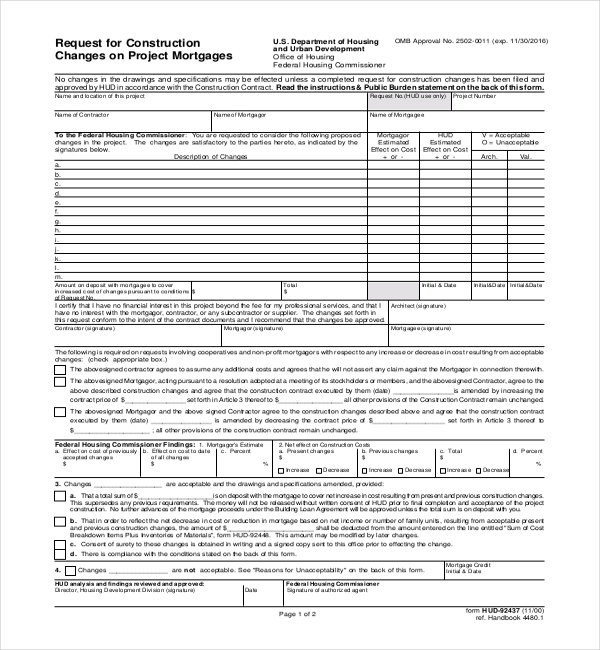 The construction order forms help in getting permission to reconstruct the original plan. An individual or a team will have to go through this process unless the land/project is a private affair. The records of any changes are kept with the construction company. The parties can use this form to avoid hassles in future about a work done without legal papers.